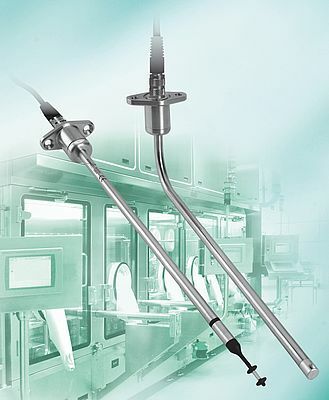 The flow sensors SS 20.415 and SS 20.515 with high-precision adjustment offer highest precision down to the 1% range. The new vertical adjustment channel eliminates influences from measuring practice during sensor adjustment and allows for the first time a sensor adjustment exactly adapted to the conditions of use. The vertical adjustment channel for flow sensors eliminates external influences that result in measuring uncertainties in measuring practice. The allows for the first time a sensor adjustment exactly adapted to the conditions of use. This gives users more security in terms of complying with the accepted tolerance criteria as part of validations. Laminar flow monitoring, i.e., the measurement of directed low-turbulence displacement flows in cleanrooms and clean areas, is one of the most challenging measuring tasks in flow metrology, due to its very flow velocities. In this area, external influences, which in applications with other directions of flow and higher velocities are completely negligible, show up as drastic measuring uncertainties. However, in general each measurement is accompanied by so-called measuring uncertainties, which can have different causes. In addition to systematic deviations, which are unavoidable and, for example in Schmidt flow sensors SS 20.415 and SS 20.515 with high-precision adjustment, amount to ±1% of the measured value plus 0.04 m/s, there are external influences in measuring practice. For thermal anemometers, for example the so-called thermal convection flow must be mentioned. It is caused by the electrically heated sensor element, which gives off thermal energy to the flow medium via its surface. This results in the already mentioned thermal convection flow in the surroundings of the sensor, which counteracts the vertically falling laminar flow in cleanroom applications. At a downdraft flow of 0.45 m/s, this amounts after all to about 10%. If the technology-related measuring uncertainties of ±1% of the measured value plus 0.04 m/s are now added to the approx. 10% from thermal convection, the maximum of 20% of the acceptance criteria tolerated is virtually used up. This is all the more critical as in practice only a total of ±10% are usually permitted for good reasons. 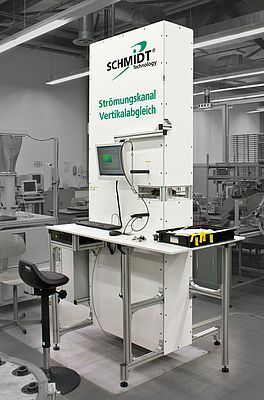 In order to be able to take such influences adequately into account in measuring practice during sensor adjustment and calibrations, Schmidt Technology has developed a vertical flow channel and installed it in its sensor production facility in St. Georgen. "The new flow channel has been designed selectively for constant production of very low medium velocities and is completely encapsulated and thermally insulated", explains Mathias Moser, Group Leader Sales at Schmidt Technology. This setup guarantees a falling air flow, as ideally required in practical application. The flow is uniform over the cross-section of the channel and cannot be affected by external influences. The insulation also shields it from external thermal influences. For adjustment or calibration of sensors, the latter are installed in the flow channel with tight fit. Used as reference is the recognized Laser Doppler measuring method (LDA), for which a small glass pane has been specifically built into the channel. "This method allows, for example, also the 10% of thermal convection flow to be detected", adds Moser.